There are two quilts heading out in the mail hopefully today. Yes, I know this first one looks familiar - it was the quilt I made for October for AAQI. Unfortunately, I did not measure closely enough and it was over the size limit of 9 X 12 so it came back to me. I took the binding off and cut it down and rebound it and now it is heading back. I actually like this smaller version better though because of the two pieces of lace that now travel across the binding. They were too beautiful to consider cutting so I folded them back and once the binding was done stitched them down again so now they intrude on the binding - I like that! This is my November donation to AAQI. 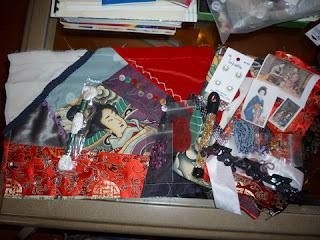 It is entitled "Kimono Girl Crazy Quilt" because of the little earring that is added in the bottom right hand corner. This little art quilt started out when it arrived to me in the form of a Christmas Cracker from Juli in last year's CQI Christmas Cracker Swap! It was full of wonderful goodies too and the block itself was beautiful and I couldn't resist making an AAQI quilt from it! I added a fan using a sequin applique and some tatting. Some vintage lace went onto the red brocade. I added more seam treatments and some ribbon embroidery as well as the little cluster at the botton right with SRE flowers, the earring of the kimono girl and a Czech glass button. I had purchased the large red flower with the bead dangles awhile ago and had no idea where I would ever use it but I like it here! Because the quilt will hang the beads have a chance to dangle nicely. The rest of the work on this piece was already in place when I received it from Juli - including the beautiful seam treatment with the coloured mother of pearl discs. I love that seam!! Thank you Juli!! So, these two are heading off in the mail to AAQI and I will start working on one to send for December now. I have recently had time to get more active in the Stitchmap Yahoo group, which is made up of apprentices and mentors and focuses on teaching all types of needlework at no charge to anymore - simply as a way of preserving these arts. This is the first challenge I have taken part in - a Victorian Pincushion. This thing is big! lol I thought I would never finish stuffing it! I used a pale pink moire fabric for my base and did silk ribbon embroidery in a heart shaped design. After stuffing, I used white silk ribbon to add the feather stitch down the sides. This was a fun project and it will be my gift for the guild swap in about ten days so one more thing off my Christmas list! I glued porcelain roses onto a couple of pinheads as the finishing touch. Here is Week 76 of the Build a Seam (BAS) Challenge. It is called the Ship-Ladder Stitch - for obvious reasons! lol It is made up of straight stitches. There is a line of straight stitches and then a second series of straight stitches, each going from the right of the top of a vertical stitch to the left of the bottom of the same stitch. There are a couple step by step photos below that will explain it better than my words do. Make a straight stitch from top to bottom and bring your needle out to the right of the top of that stitch. Complete that straight stitch by taking your needle down to the left of the bottom of the vertical straight and bring your needle back up in the center in position to begin the next vertical straight stitch. This is my first attempt at the stitch so it is not perfect. It is important to keep the slanting stitches uniform in length and angle - the regularity creates the beauty of the stitch. Have fun with this one! Whose Stupid Idea Was This? A homemade Christmas? All the gifts to be made lovingly by hand? Whose stupid idea was that? Yeah, okay, it was mine! Now here we are exactly one month before Christmas and all I have to show for this plan is a lot of ideas and piles of supplies! 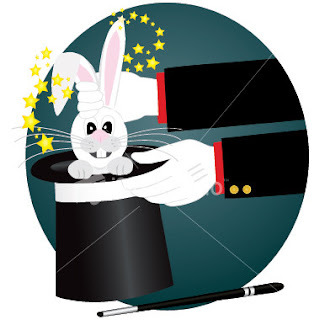 The question now remains - "Can I pull this rabbit out of the hat?" Today is the second day of howling winds of over 100 km per hour. It is getting on my nerves! This is my next door neighbour's greenhouse sitting upside down quite a way from where it was earlier in the week when it was right side up. In this one you can see what looks like a white platform in front of a little shed. Well, that was the roof of the shed before it decided to go walkabout. Everywhere there are tree branches down and shingles off. I wish this wind would just quit! So many exciting projects are coming up for the New Year! 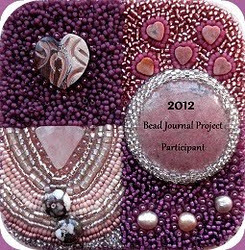 Here is another one - the Bead Journal Project! You can read all about the rules here. If you haven`t heard about the Bead Journal Project before (do you live in a cave? LOL) you can read about it here. Here is some great news for everyone! Sharon Boggon has just announced that she's doing Take a Stitch Tuesday (TAST) again starting on the third of January. You can get details on her blog. Thanks Sharon! I LOVE my MOO cards! Well, do you love them? I so love my MOO cards - they just arrived in the mail! I was limited in the photos I could upload because of problems with my connection but I did manage to get two of my favourite pieces loaded so they could be on my cards. I got these because I needed them to include in the kits I put together with my classes so they were really a sensible purchase. I just didn't expect to love them so much when they got here! lol Too cool! I am very excited about this new event, orchestrated by Kathy Shaw! We recently received the exciting news that J. M. Michler will be this year's Honourary Chairman! How exciting is that! 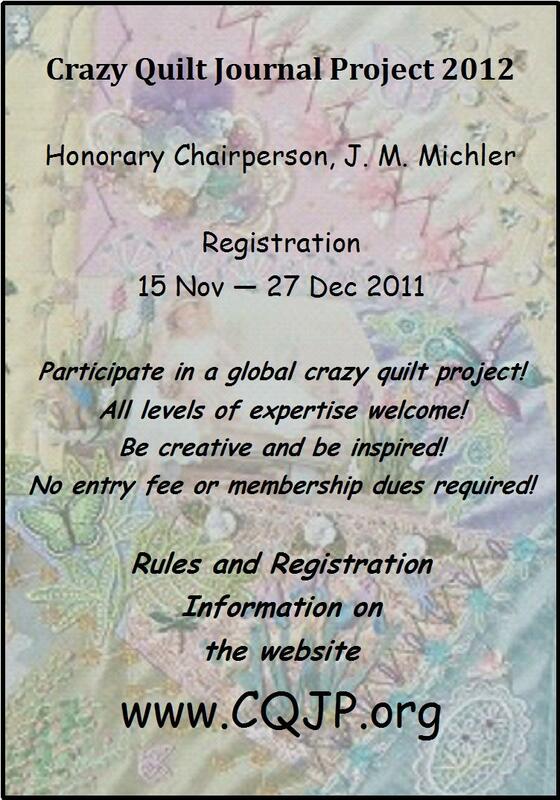 -- Participants will complete one crazy quilt block each month. Size and shape can vary...but it should be at least equivalent to a 6" square. 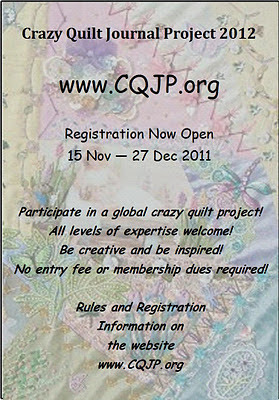 -- Participants that want their efforts published (and we hope that they do...because their work could inspire someone else to begin their own crazy quilt journey)....can submit photos to the Committee (via email to: chairperson@cqjp.org) for inclusion on the CQJP2012 blog (link: http://www.cqjp2012.blogspot.com). 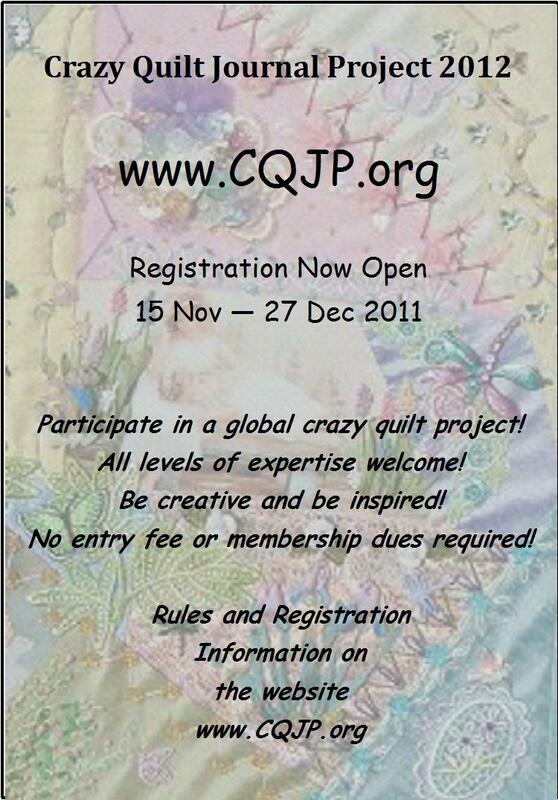 -- Complete rules, registration information, and general information about the CQJP2012 is at the website (link: http://www.cqjp.org). 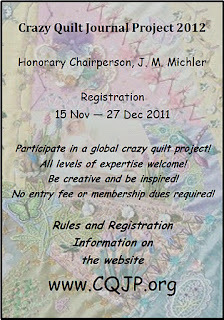 -- The CQJP2012 is honored to have J. M. Michler, author of The Magic of Crazy Quilting as our Honorary Chairperson this year. 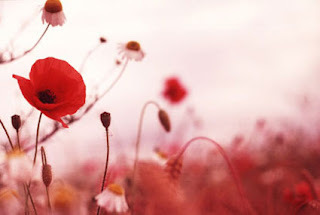 Remember - it is not necessary for you to have a blog or website to participate! Everyone is welcome! If you are not familiar with the Build a Seam (BAS) Challenge, briefly, every week or two I post a picture of the basic bare bones of a seam treatment or a new stitch, and we have a week to decide on and complete whatever other stitches and embellishments are needed to make it a complete - and gorgeous! - seam treatment. I am really enjoying training myself to see beyond the basic herringbone or cretan stitch I like to fall back on, and to learn to make more passes across the seam adding more stitches, beads. SRE, etc. - I hope you do too! There is a list of the stitches with links to the original posts for each on the right hand side of my blog here. Feel free to jump in anytime! So, without further ado, here is a tutorial for Build a Seam (BAS) #76, called Plaited Fly Filling Stitch. Begin with a row of fly stitch , working horizontally and overlapping the stitches by half each time, as shown in the photo below. Make another row of fly stitch underneath the first one, lining them up as shown. Continue on in this manner until you have filled the space you want to fill. You end up with a neat geometric pattern with lots of little nooks and crannys you could embellish further if you would like to. Here is my finished sample of Plaited Fly Filling Stitch, which I used on Sue's block. Have fun with this one! I had the pleasure of introducing a group of 6 ladies in High River to crazy quilting today! What a wonderful stitching group they have! They have been meeting together for 12 years and are such a friendly, happy bunch. They made me feel so welcome and I left feeling more than a little jealous of their group. The ladies all had their blocks already pieced so it was straight to the fun and games of embellishment - motifs and seam treatments. We managed to experiment with several common stitches - herringbone, cretan, feather , did some combinations of stitches for more elaborate seams and also got a good start on a sample of silk ribbon embroidery, making several types of roses and Japanese ribbon stitch leaves. We had a little fun embossing velvet and they really enjoyed that. It was a real pleasure to introduce such an enthusiastic group to my favourite art form! I was the first stitcher on Sue's FFT (Fabulous First Timers) 14 round robin block. It is a great block made up of wonderful silks and a very cool cotton print. I love to be first on a block because you get to set the tone on the block and are not restricted by what has already been done on the block. Selfish, I know! This seam you might recognize as the BAS 75 - Roman Stitch post a couple days ago. I added a line of beads to each side of the Roman Stitch to add a bit of sparkle. I filled in the small corner patch with a filler stitch - more on that one later - it will be BAS 76 next week. In the top right hand corner of the block I added a fan. Thanks to the help of my friends at CQI, I was finally able to locate the little sequin fans to use as a base for larger fans. I love these things! All I did to make the fan was to gather some organza ribbon with a gold edge that I had and stitch it down under the sequin fan - then I added a store bought gold tassel. On the seam under the fan I added a piece of vintage lace and a gold cord. The ribbon with the sequin flowers was an addition Sue had already made to the block before she sent it out. In the bottom left hand corner of the block I finally found the perfect spot to use a piece of Nicki Lee's wonderful hand dyed lace I had been saving. I added a seam treatment to the right of it, comprised of a number of stitches, sequins and beads. I'll have this off in the mail to the next stitcher in the round robin Monday morning - I can't wait to get the next block to stitch on! Sorry for the huge delay in getting the next Build a Seam stitch out. My new job and a heavy teaching schedule this month are really playing havoc with my time! Excuse my less than perfect first attempt at this stitch and have fun creating it yourself! Roman Stitch looks best when worked in a medium to heavy weight thread. This silk thread I used was not quite thick enough but what can I say? I love silk. Start by bringing your needle up at the left hand side and take it down again directly across on the far side of the seam. Bring your needle back up again in the center. You can get different effects by either making your center stitch a bit lower as I have which creates a slanted chevron effect or you can make your center stitch parallel to the long stitch instead. Whichever way you decide to go, take a tiny stitch over your long thread, catching it in the center. So, you have a long stitch now going from left to right and a tiny stitch holding your thread in the center. Bring your needle back up at the left just below where you started and keep repeating. Here is that I ended up with. Roman Stitch creates a fairly wide solid stitch on your seam and finding ways to further embellish the seam should be fun. Roman Stitch is good for use in leaf shapes as well as other forms where you might want a center rib effect. Have fun with it! Yesterday I had the opportunity to teach a class on Fabric Manipulation & Embellishment at the Culture Centre in High River. Six wonderful ladies joined me for a day of fun and learning, exploring new techniques that can be added to art quilts, fibre arts, mixed media and collages. Some of the materials we explored were Tyvek, Texture Magic, Angelina fibres, alcohol inks for dying lace, acrylic paints and fabric medium for stamping on fabrics, silk velvet for embossing with stamps, encrusted beading stitch, and adding glitter. It was so much fun to share what I have learned about playing with these "toys"! The ladies had fun creating wonderful bubbly fabric using Texture Magic and stitching various grid shapes. The velvet embossing was a big hit and the samples turned out beautifully! I know I will be seeing these samples again when some of the ladies return for a crazy quilting class next month! Well, I think it is time to look at my New Year Goals again since the year is coming to a close and I'm running out of time to do anything about them. This makes for a long post with no photos so bear with me! 1 . This year I am going to continue with teaching crazy quilting that I started last year. I will make as many opportunities for myself as I can to do this. I am also going to build a workshop or class around a specific project that I'll design and submit an application to teach it wherever the opportunity presents itself. More of the same as last year - just stretching further with it. I have worked as hard as I could on this one. The classes I proposed in the spring did not run due to lack of registration although I taught a full day workshop to Calgary Guild of Needle & Fibre Arts. My fall classes are running now - I have a full day workshop this Saturday on Fabric Manipulation and Embellishment and then two full day workshops on Crazy Quilting before the end of the year. I am going to be featured as the Artist of the Month in January in the Country of Vulcan so I hope that will promote some interest in crazy quilting there and maybe I'll get enough registration for a class to run there in the spring as a result. The big project I wanted to design never got past the planning stage - just not enough hours in the day! 2. I will try to go ahead with the "Homemade Christmas" plan that fell by the wayside last year. I have already told my family that I intend to be on a cruise ship somewhere during the holidays next year (that part might not happen! lol) and that I will be making all the presents I give. If you made two gifts each month, you would have 24 gifts ready next Christmas. Not just that you have made something from the heart, but avoiding a good part of the annual Christmas panic! I am resolving to do this and will post photos of them as I get them done. None of my family reads my blog so no worries there. There is less than two months til Christmas! Did you realize that?! lol This plan is still in effect as far as the Homemade Christmas portion goes but the part about no annual Christmas panic might be overly optomistic! Still only in the planning stages! Drat! I am working on a wall hanging at the moment but the full size quilt hasn't even been started. 4. I will finish my crazy quilt Christmas tree skirt in progress in time to enter it in the Calgary Stampede Creative Living competition next summer. This one has been rolled over to next year's goals - hoping I'll get it done by then. Right now classes, Christmas coming and the new job are taking every hour of the day and then some! 5. This year I will enter at least four competitions with my stitching - that`s one every four months so it sounds not too intimidating! I only got halfway this last year on this resolution so I'm going to try again. Just didn't happen! I am working on two entries for the EAC logo contest but who knows if they will be done in time to submit? 6. This year I will write about crazy quilting and stitching and submit it for publication somewhere. Let`s see.... twice! So at least two separate things will be submitted for publication.... somewhere. Their being accepted and published is not part of this goal but would be a great addition! I actually did this one! I have a couple articles submitted, three in fact, and am now just waiting to see if they are published. Writing and submitting them were my goal though, not getting them published since that part is out of my hands, so I achieved this one! 7. I will create and give at least one item a month to charity - this will be my service project for the year. I will post pictures to keep myself honest. Some of the groups I would like to do some work for are the Alzheimer's Art Quilt Initiative (AAQI) continuing with the pledge I have made to them, Grandmothers for Grandmothers (the purse auction), Aids Angels, The Toy Society, and CQI's Making Memories project for Breast Cancer. In addition I'll be doing small things on a local basis like baby quilts and baby sets for the hospital gift shop (profits go to the Ladies Hospital Auxiliary) and knit caps for the newborns at the same hospital as well as placemats for Meals on Wheels. There are actually a lot of things you can do locally if you look around. Even the local library is in need of book bags for the local literacy program. I went over the top on this one - more than achieved these goals! Most of my donations were AAQI art quilts, one a month since February, but I also managed to donate items to the library's silent auction, the silent auction for the school here in town, and to the local hospital. So, this one is achieved! 8. I have decided, because I am a terrible procrastinator, that I will stitch a minimum of 15 minutes per day. Once I start I am likely to carry on longer, but starting is the difficult part for me. This was the best goal I set for myself last year - I highly recommend it! Doing that 15 minutes a day keeps the creative blocks at bay and really increases my output. I just can't say enough good things about the 15 minutes a day. It has even extended to other areas of my life - 15 minutes of housework at a time, 15 minutes of organizing, or sorting, or computer work... They all add up! This goal is met or not met every day and continues to be a daily challenge. Most days I manage it now but some days I miss due to life getting in the way and ordinary, garden variety fatigue. I continue to recommend this goal for everyone who wants to be more productive though - can't say enough good things about the 15 minute a day goal! 9. I will organize and clean out my sewing room so that I can actually work there! And find things! I'll work on this one hour a day (minimum) until it is accomplished. I have added the library room adjacent to my sewing room to my work space as an annex so it should be easier to find places for everything. Done! Having a workable space is great too! Of course, you have to manage the upkeep as well and keep it organized... Not in a good spot right now but still workable. The stash does seem to have spread again though into almost every room in the house! 10. I am going to put the time and energy necessary into Leslie's and my Etsy shop and get it going. I decided that sharing an Etsy shop with someone else was not the way to go - much too complicated with the postage costs from two different countries to contend with. So, I've bowed out of this and will get my own Etsy shop up and running instead - only time is stopping me right now. 11. The best advice I ever received about UFOs (UnFinished Objects),was from a quilting teacher, Anne Severson: that perhaps the reason you haven't finished something was because you had already learned what it had to teach you and have grown past it. So, bearing this in mind, I will deal with at least one UFO a month - either get rid of it if it no longer holds my interest or to put it back into my stitching schedule if it is still a part of my stitching journey. I might even finish a few in the progress! I didn't keep track but I'm sure I have made it on this one. I consider anything I have bought and brought home a UFO even if I haven't started it since it takes up space. I've sent items to the ladies in Texas, other stitchers, donated kits to various causes, so it's all good! Well, that's it! I'm running out of year here to achieve my 2011 goals but I have managed to make progress on them and that's what counts! Right now my life seems insanely busy - adjusting to the new job is really taking some doing. I am working as a caregiver now for a gentleman in town who was badly injured in a car accident a couple years ago. I drive him where he needs to go and visit with him on the days he doesn't need to go anywhere, make coffee and help where needed. This week we have just added three outings a week to a wheelchair accessible swimming pool in a nearby town so busier and busier! This is pleasant work though - he is a very cheerful and congenial man and very easy to get along with. It can be tiring though so fatigue has become a factor in what I get accomplished at home. After work tonight, I'll be coming home to put together all my kits for the class I am teaching tomorrow. 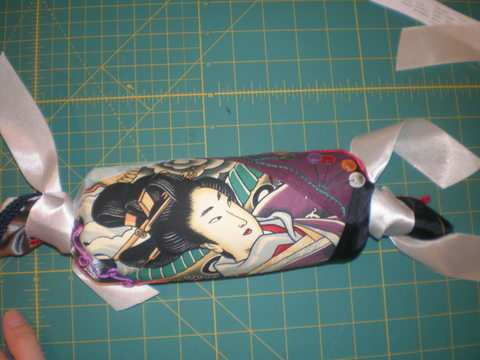 I have lots of great things for us to play with - tyvek, texture magic, silk velvet to emboss, angelina fibers, etc. so it should be fun! I became inspired when I took a Fabric Manipulation class as Seminar this year and have been experimenting with other methods since then and want to share my excitement about these techniques. I'll try to remember the camera tomorrow and will share how it turned out here afterwards. 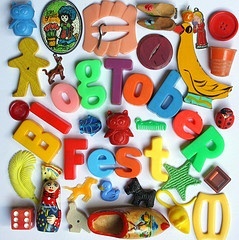 Well, Blogtoberfest is over for another year but I really enjoyed the challenge of blogging every day and the fun of discovering new blogs to visit! I didn't quite achieve my goal - I had 28 posts in October, not 31, but I am fairly happy with what I did post and will be joining in again next year to try again! It is a good motivator to get you posting so why not give it a try? Thanks to dd, I have just discovered MyFitnessPal online - it is great! It is all free and you can sign up and then you are able to track your calorie intake, track your exercise and fitness, and so much more I have yet to discover! You can even get badges for your blog with your weight loss and they update automatically. So, you can watch for those here once I have something to report, lol. In the meantime, this is my Day 1 so cheer me on! Something had to be done about all that Hallowe'en candy I ate. lol.